DC Universe Animated Original Movies - SUPERMAN vs THE ELITE | Warped Factor - Words in the Key of Geek. 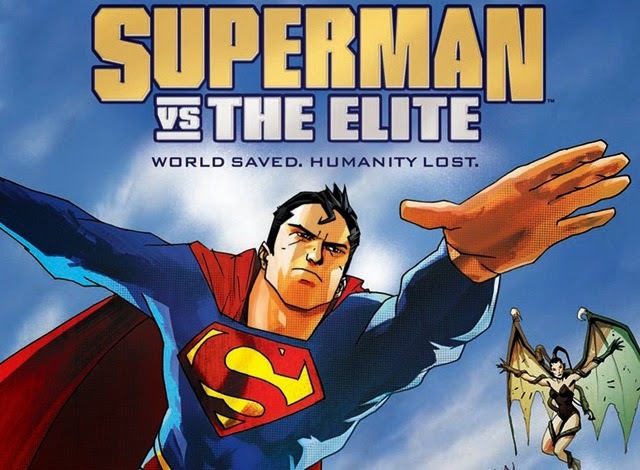 Da'Mon Guy continues his look back at the animated movies from the DC Comics universe, today he revisits 2012s Superman vs The Elite. Superman Vs The Elite is a contemplative, action packed testament that delves deep into the core of the hero mythos as it questions the morality of superheroes. It is one of the more unique perspectives on the adventures of the world’s most famous hero, which poses a great question about how the forces of evil should be handled once they are brought to justice. Does the evil that the heroes defend the world from deserve to be judged with the same law system as normal people or should they face death as a penalty for their crimes against humanity? Despite the message being delivered in the form of animation, this escapade has great depth. At the core of the film is the important moral debate about power and the appropriation of it. Superman is forced to question his approach to facing evil, as truth, justice, and the American way may not be the ideal approach to defeating evil in the 21st century. Life and death is shown in its most realistic outlook seen in any story to use the character, this makes “Elite” one of the most pragmatic animated adventures featuring the comic book legend. Superman Vs The Elite questions every aspect of Superman’s fiber, in a story that truly expresses why he is considered the world’s greatest hero.